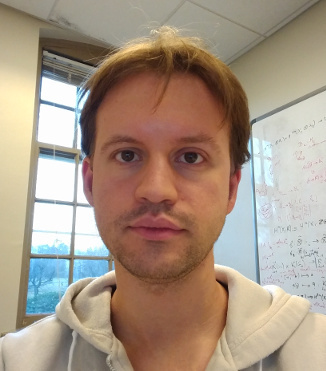 My name is Guillaume Brunerie and I’m a researcher in mathematics and computer science working mainly in homotopy type theory, a field combining mathematics (in particular homotopy theory, category theory, and constructive mathematics) and theoretical computer science (in particular type theory, logic, and proof assistants). I am currently a postdoctoral researcher in the Logic Group of Stockholm University since September 2018. Previously, I was a postdoctoral member of the School of Mathematics of the Institute for Advanced Study in Princeton, New Jersey. From September 2013 to August 2016, I was a PhD student at the Laboratoire J.A. Dieudonné under the supervision of Carlos Simpson. I successfully defended my thesis on June 15th 2016. On the homotopy groups of spheres in homotopy type theory (187 pages, in English, with a 20-page summary in French at the end). You can also download the slides of the oral presentation. The James construction and π4(𝕊3) in homotopy type theory. Guillaume Brunerie. Journal of Automated Reasoning, Special Issue on Homotopy Type Theory and Univalent Foundations, Springer. doi:10.1007/s10817-018-9468-2. A Cubical Approach to Synthetic Homotopy Theory. Dan Licata and Guillaume Brunerie. 2015 30th Annual ACM/IEEE Symposium on Logic in Computer Science (LICS 2015), pages 92–103, IEEE. doi:10.1109/LICS.2015.19. πn(Sn) in Homotopy Type Theory. Dan Licata and Guillaume Brunerie. Certified Programs and Proofs (CPP 2013), volume 8307 of Lecture Notes in Computer Science (LNCS), pages 1–16. Springer. doi:10.1007/978-3-319-03545-1. Cartesian Cubical Type Theory. Carlo Angiuli, Guillaume Brunerie, Thierry Coquand, Kuen-Bang Hou (Favonia), Robert Harper, Daniel R. Licata. Preprint. A poster on homotopy type theory (in French, 2015). Structure topologique de l’espace des réseaux unitaires, initiation to research on the proof that the space of unitary lattices of ℝ2 is homemorphic to the complement of the trefoil knot in S3 (in French, 2009). Densdisigeblaj spacoj, a proof of a theorem in point-set topology: every metric space without isolated points can be partitioned in two dense subspaces (in Esperanto, 2008). You can contact me by email at the address guillaume.brunerie@gmail.com.